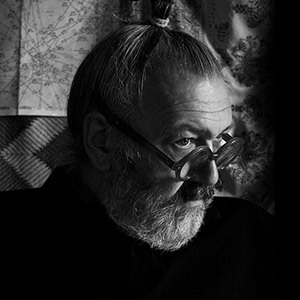 Costantino Morosin was born in the Veneto region in 1950, and attended the Accademia delle Belle Arti di Venezia, graduating in scenography in 1975. After having worked in Africa for FAO and WWF, he moved to Milan, then Turin, and finally Rome, where he began the weekly journal, “Time Out – a Roma cosa c’è”. He was one of the first in Italy to create digital images and interpolations, including the artistic holograms like the “Calcata 1982: Audition for a Future Kingdom” logo. His creative cycle saw the meeting of cross-media and technology. As a forerunner for emerging artistic trends, Morosin concentrated on the natural world, and turning to the medieval quarter, Calcata, near Rome, began using materials extracted there. In 1996, along with Anna Demyttenaere, he founded the “Opera Bosco”, an art museum. During the 80’s and 90’s, as his works continued to win awards on the national level, he continued to use tuff, rock, glass and terracotta in his sculptures, and is known in particular for his works “Troni di Calcata” and “Cavalli Trilitici di Castelfranco”, three travertine monoliths weighing 26 tons. Starting in 2002, he began producing the international “Sigma”, territorial works based on GPS satellite tracks. In 2016, he designed the “Fabula” suspension for Slamp.